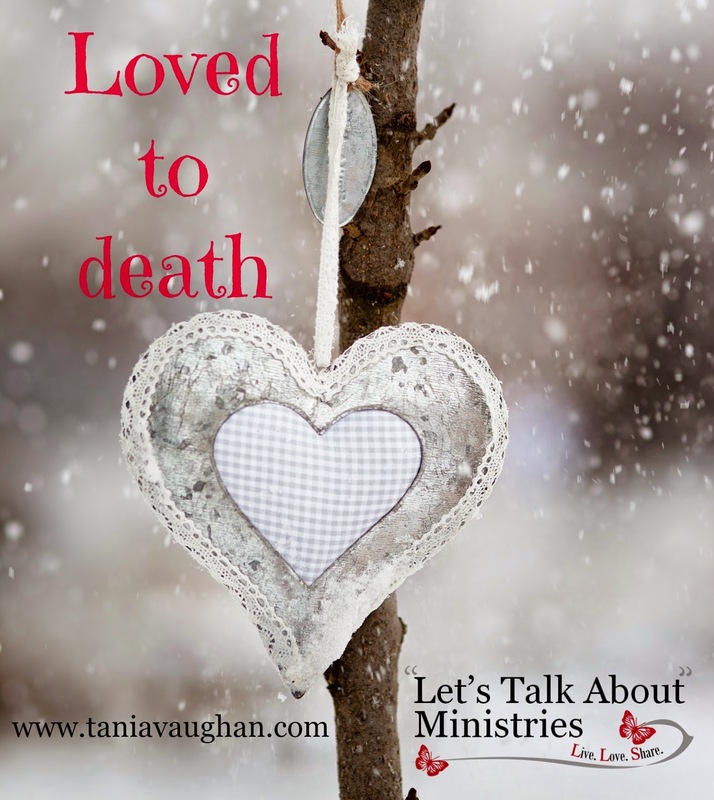 As believers we are called to accept being loved to death. Accepting the love of Christ, bringing him into your life means that you will die - Are you willing to lose your life? Jesus was loved to death by God. He went to the cross for the love of God and because of the love of God. Jesus came to give life and life to the full, he came to love. He laid down his life so that you can know life in all it's fullness. (John 10:10-11). A life lived without Christ is not a full life, it is not all that it could be and it is not all that it is made to be. Even in the love of Christ, life here and now is only a glimpse of the life to come. In this western world it is unlikely that we will be called to put our physical lives on the line for Christ - but I often ask myself if I would or could, it's a challenge to answer! In other parts of the world being loved by and loving God is an actual life or death question. However we are still called to lose the love of life; the things and the people of life as we know it. Jesus uses examples to show how life and possessions hold us back from truly following God. In Matthew 8, a disciple asks that before he follow Jesus he be allowed to go and bury his Father, whether this meant to care for him until to death (as some commentators feel) or to literally bury him does not matter. Jesus expects a total commitment and response to following him, allowing for no-one to come before him. Jesus really drives this home in Luke 14, going so far as to say that to follow him you must hate your mother, father, wife, children and siblings. Hate seems a strong word to use against other people in light of the previous study about loving others, but we are to hate and put away from us anything that is more important in our life than God. It is not only people that have a hold over our lives but also our possessions. Many have been the sermons about giving gladly and not serving two masters. Jesus' conversation with the rich young man in Matthew 19 shows how the hold that our things have on us can prevent us from following Jesus. To fully know the love of God, to live the full life of Christ we must keep the great commandment "To love the Lord your God with all your heart and with all your soul and with all your mind." To be willing to lose the things and the people in our lives in favour of God, to truly put him at the centre of all that we do. If you love your life you are losing out on a full and eternal life. "...while the man who hates his life in this world will keep it for eternal life." Hello Tania, Interestingly, my pastor spoke on something similar. When we lose our lives we will find it, Wonderful. Putting aside the things we love can be difficult. But you point out that we will have a better life. I think this is often gets twisted into thoughts that we can't do anything we enjoy, but in reality. It is encouraging us to keep things in perspective. We only have things and enjoy them because they are a gift to us. Tania, thanks so much for linking up at Soul Survival. I love this post. I read it right after I posted today's (2/20) post. We had many of the same thoughts. Events in the world give us a greater opportunity to think about these things, don't they? I'll be pinning this to my "Mondays @ Soul Survival" board and hope many will read it and take your questions to heart. Blessings!